A large building full of books and desks and children in Sheffield has opened amid controversy after it refused to call itself a school because negative connotations associated with working at a school might hold back the careers of those grasping wannabes trying to climb the greasy educational pole. Linda Billingsworth was formerly the head teacher at the large building full of books and desks and children but who now prefers to be known as "Office dweller with the biggest car". She has defended the decision saying that learning is about the role of education in the community and preparing children for life in the real world. "Take what used to be called mathematics, that has all sorts of negative connotations of being able to add up, do vectors, or differentiation. All of which I found very difficult at school," explained Billingsworth. "So we renamed maths, and now the young people have regular Soduku Theory lessons instead, and they are really helping me along – I can do the intermediate puzzles with only a little help from the year 7s." Ms Billingsworth said that she wanted to take all negative connotations away from the Watercliffe Meadow Place For Idiots To Pretend To Be Teachers, and instead give her staff more opportunities to really get to the heart of education. "If I just called you an English Teacher, people would know what you do and what standards are expected of you," she explained. "However if I called you an Operative for the Expansion of the Young Person’s Mind all you know is that these people should be on the upper pay scales within the education authority." 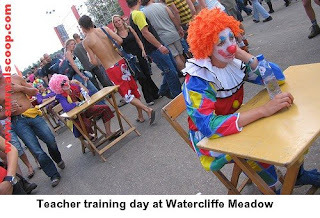 Ms Billingsworth said that she wants to use the experience gained at Watercliffe Meadows Place For Idiots to Pretend to be Teachers at perhaps some of the nation’s leading educational establishments. "I would consider a role at one of the grown-up places such as Oxford," she said. "But really it would have to be called the Cherwell Uber-Foundry of Ultimate Genius. At the very least." The change has been difficult to absorb in many areas of the community. There are reports that the road outside the large building with children, desks and books in it has had several accidents due to cars skidding on the many gallons of paint used to indicate what used to say "school". However there are supporters of the renaming approach. A school in South East London has renamed itself the "Thamesmead Academy For Drugs and Knifing". it's political handcarts gone to hell madness i tells you! You say that, but think of the children. They get to go somewhere that will make them feel special, not just like they have to pass exams, but that they are glowing young people. i've never read so much garbbage in all my life. so what! watercliffe meadow is a great school with great staff who are ALL dedicated to giving our children the best start to education. as for the the teachers being idiots it's the small minded people who know nothing about what goes off at the school. keep it up Mrs Kindon your doing a great job. LOL - great satire. It ridiculous that the staff at schools like this get paid thousands to come up with daft ideas. You have to wonder about parents that still send their children to "fad centres" that if these schools were really renamed they would be called.